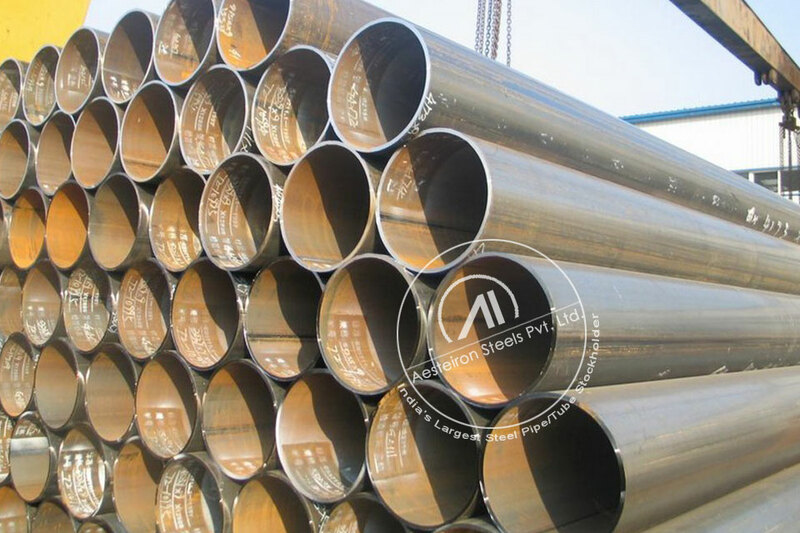 Finding a trustworthy and reliable vendor of high quality ASTM A335 P22 Alloy Steel Boiler Pipe, Aesteiron Steels is India's #1 source for ASTM A335 P22 Alloy Steel Boiler Pipe, 30000+ clients in 70 countries. We supply High precision ASTM A335 P22 Alloy Steel Boiler Pipe & high quality alloy grades pipes & tubes to Oil And Gas, Nuclear And Power, Aerospace, Chemical Process, Medical, High Purity and High Performance. » What is ASTM A335 P22 Alloy Steel Boiler Pipe? What is ASTM A335 P22 Alloy Steel Boiler Pipe? ASTM A335 P22 Alloy Steel Boiler Pipe also known as Seamless Alloy Steel Pipes "Chrome Moly" ASTM A/ASME SA335 Grades P22. ASTM A335 P22 Alloy Steel Boiler Pipe is High Temperature Pipes and Tubes & available in form of Round Pipes/Tubes, Square Pipes/Tubes, Rectangular Pipe/Tubes, Coiled Tubes, "U" Shape, Pan Cake Coils and Hydraulic Tubes. 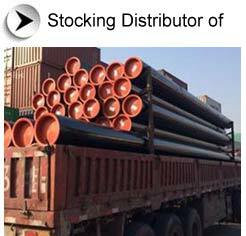 Usage: Boiler Tube, Construction of boilers, pipelines and equipments for high temperature and pressure services, and also suitable to be curved and flanged. ASTM A335 P22 Alloy Steel Boiler Pipe Argentina, (Buenos Aires) TENARIS SIDERCA S.A.I.C ASTM A335 P22 Alloy Steel Boiler Pipe Poland (Katowice) ALCHEMIA S.A.
ASTM A335 P22 Alloy Steel Boiler Pipe Belarus (St. Petersburg) OJSC "Byelorussian Steel Works-Management Company of ASTM A335 P22 Alloy Steel Boiler Pipe Romania (Galatz) TMK-ARTROM S.A.
ASTM A335 P22 Alloy Steel Boiler Pipe China (Zhoushan) BAOFENG STEEL GROUP CO., LTD ASTM A335 P22 Alloy Steel Boiler Pipe Spain (Barcelona) TRANSFORMACIONES METALÚRGICAS S.A.U. ASTM A335 P22 Alloy Steel Boiler Pipe China (Wuhan) HUBEI XINYEGANG STEEL CO., LTD ASTM A335 P22 Alloy Steel Boiler Pipe Taiwan, Republic of China (Kaohsiung) FROCH ENTERPRISE CO., LTD.
ASTM A335 P22 Alloy Steel Boiler Pipe China (Shanghai Port) HUZHOU HUAXIANG STAINLESS STEEL PIPE CO., LTD ASTM A335 P22 Alloy Steel Boiler Pipe Ukraine(Mykolaiv) VSMPO TITAN UKRAINE LTD"
ASTM A335 P22 Alloy Steel Boiler Pipe China (Nanjing) JIANGSU CHENGDE STEEL TUBE SHARE Co., Ltd ASTM A335 P22 Alloy Steel Boiler Pipe Ukraine(Mykolaiv) LLC "INTERPIPE NIKO TUBE"
ASTM A335 P22 Alloy Steel Boiler Pipe China (Wuhan) PANGANG GROUP CHENGDU STEEL & VANADIUM CO., LTD ASTM A335 P22 Alloy Steel Boiler Pipe Korea (Seoul) DAEJOO HEAVY INDUSTRIES CO., LTD.
ASTM A335 P22 Alloy Steel Boiler Pipe China (Wuhan) PANGANG GROUP CHENGDU STEEL & VANADIUM CO., LTD ASTM A335 P22 Alloy Steel Boiler Pipe Korea (Mokpo) DESEN CO., LTD.
ASTM A335 P22 Alloy Steel Boiler Pipe China (Nanjing) SANDVIK MATERIALS TECHNOLOGY(CHINA) CO., LTD. ASTM A335 P22 Alloy Steel Boiler Pipe Korea (Mokpo) HUSTEEL CO., LTD.
ASTM A335 P22 Alloy Steel Boiler Pipe China (Dalian) SANKYO STAINLESS TUBES (SHENYANG) CO., LTD ASTM A335 P22 Alloy Steel Boiler Pipe Korea (Seoul) HUSTEEL CO., LTD.
ASTM A335 P22 Alloy Steel Boiler Pipe China (Shanghai Port) SHANGHAI FENGXIAN STEEL TUBE FACTORY CO. LTD ASTM A335 P22 Alloy Steel Boiler Pipe Korea (Busan Port) JIN YOUNG METAL CO.LTD. ASTM A335 P22 Alloy Steel Boiler Pipe China (Shanghai Port) SHANGHAI MAXMOUNT SPECIAL STEEL CO. LTD ASTM A335 P22 Alloy Steel Boiler Pipe Korea (Busan Port) KOREA ENERGY & PROCESS CO., LTD.
ASTM A335 P22 Alloy Steel Boiler Pipe China (Shanghai Port) SHANGHAI TIANYANG STEEL TUBE CO. LTD ASTM A335 P22 Alloy Steel Boiler Pipe Korea (Ulsan) KUMKANG KIND CO., LTD.
ASTM A335 P22 Alloy Steel Boiler Pipe China (Dalian) TIANJIN PIPE (GROUP) CORPORATION ASTM A335 P22 Alloy Steel Boiler Pipe Korea (Ulsan) NEXTEEL CO. LTD.
ASTM A335 P22 Alloy Steel Boiler Pipe China (Nanjing) YANGZHOU CHENGDE STEEL PIPE CO., LTD. ASTM A335 P22 Alloy Steel Boiler Pipe Korea (Ulsan) STEEL FLOWER Co., Ltd.
ASTM A335 P22 Alloy Steel Boiler Pipe China (Qingdao) YANTAI STEEL PIPE CO., LTD. OF LAIWU IRON & STEEL GROUP ASTM A335 P22 Alloy Steel Boiler Pipe Korea (Ulsan) SeAH STEEL CORP.
ASTM A335 P22 Alloy Steel Boiler Pipe China (Shanghai Port) ZHEJIANG BAIJI PIPES CO., LTD. ASTM A335 P22 Alloy Steel Boiler Pipe Korea (Changwon) SeAH STEEL CORP.
ASTM A335 P22 Alloy Steel Boiler Pipe China (Shanghai Port) ZHEJIANG DETRANS PIPING CO., LTD. ASTM A335 P22 Alloy Steel Boiler Pipe Korea (Mokpo) SeAH STEEL CORP.
ASTM A335 P22 Alloy Steel Boiler Pipe China (Shanghai Port) ZHEJIANG JIULI HI-TECH METALS CO. LTD ASTM A335 P22 Alloy Steel Boiler Pipe Korea (Busan Port) YCP Co., Ltd.
ASTM A335 P22 Alloy Steel Boiler Pipe China (Zhoushan) ZHEJIANG STELLAR PIPE INDUSTRY CO., LTD ASTM A335 P22 Alloy Steel Boiler Pipe Mexico (Veracruz) PRECITUBO, S.A., de C.V.
ASTM A335 P22 Alloy Steel Boiler Pipe China (Zhoushan) ZHEJIANG TSINGSHAN STEEL PIPE CO., LTD ASTM A335 P22 Alloy Steel Boiler Pipe Poland (Katowice) ALCHEMIA S.A.
ASTM A335 P22 Alloy Steel Boiler Pipe Czech Republic (Prague) TRINECKÉ ŽELEZÁRNY, a.s ASTM A335 P22 Alloy Steel Boiler Pipe Japan (Kobe) NISSHIN STAINLESS STEEL TUBING CO., LTD.
ASTM A335 P22 Alloy Steel Boiler Pipe Finland (Helsinki/Helsingfors) OSTP Finland Oy Ab ASTM A335 P22 Alloy Steel Boiler Pipe Japan (Nagasaki) OSAKA STEEL TUBE CO., LTD.
ASTM A335 P22 Alloy Steel Boiler Pipe France (Lyon) VALLOUREC TUBES FRANCE ASTM A335 P22 Alloy Steel Boiler Pipe Japan (Kobe) SHOWA STEEL TUBE WORKS, Ltd.
ASTM A335 P22 Alloy Steel Boiler Pipe Germany (Hamburg) BENTELER STEEL/TUBE GmbH ASTM A335 P22 Alloy Steel Boiler Pipe Japan (Kobe) STAINLESS KUZE CO., LTD.
ASTM A335 P22 Alloy Steel Boiler Pipe Germany (Hamburg) BENTELER STEEL/TUBE GmbH ASTM A335 P22 Alloy Steel Boiler Pipe Japan (Kobe) STAINLESS PIPE KOGYO CO., LTD.
ASTM A335 P22 Alloy Steel Boiler Pipe Germany (Hamburg) ESTA Rohr GmbH ASTM A335 P22 Alloy Steel Boiler Pipe Japan (Yokohama) TOKYO SEIMITSUKAN CO., LTD.
ASTM A335 P22 Alloy Steel Boiler Pipe Germany (Hamburg) H. BUTTING GMBH & CO. KG ASTM A335 P22 Alloy Steel Boiler Pipe Korea (Changwon) BNB SUNGWON Co., Ltd.
ASTM A335 P22 Alloy Steel Boiler Pipe Germany (Hamburg) HOESCH SCHWERTER PROFILE GmbH ASTM A335 P22 Alloy Steel Boiler Pipe Korea (Changwon) DAE CHUN INDUSTRIAL CO., LTD.
ASTM A335 P22 Alloy Steel Boiler Pipe Germany (Hamburg) NIROSAN EDELSTAHLROHR GmbH ASTM A335 P22 Alloy Steel Boiler Pipe Japan (Kobe) DAIICHI STAINLESS KOKAN Co., Ltd.
ASTM A335 P22 Alloy Steel Boiler Pipe Germany (Hamburg) POPPE & POTTHOFF PRÄZISIONSSTAHLROHRE GmbH ASTM A335 P22 Alloy Steel Boiler Pipe Japan (Yokohama) HANEDA PIPE WORKS CO., LTD.
ASTM A335 P22 Alloy Steel Boiler Pipe Germany (Hamburg) ROHRWERK MAXHÜTTE GMBH ASTM A335 P22 Alloy Steel Boiler Pipe Japan (Kobe) IGETA STEEL TUBE INDUSTRIES CO., LTD.
ASTM A335 P22 Alloy Steel Boiler Pipe Germany (Hamburg) SALZGITTER MANNESMANN LINE PIPE GmbH ASTM A335 P22 Alloy Steel Boiler Pipe Japan (Nagasaki) KOBE SPECIAL TUBE CO., LTD.
ASTM A335 P22 Alloy Steel Boiler Pipe Germany (Hamburg) SALZGITTER MANNESMANN STAINLESS TUBES ASTM A335 P22 Alloy Steel Boiler Pipe Japan (Yokohama) NAS TOA CO., LTD.
ASTM A335 P22 Alloy Steel Boiler Pipe Germany (Hamburg) SANDVIK P&P ZN der SANDVIK MATERIALS TECHNOLOGY ASTM A335 P22 Alloy Steel Boiler Pipe Japan (Kobe) NIPPON METAL TUBE CO., LTD.
ASTM A335 P22 Alloy Steel Boiler Pipe Germany (Hamburg) Sosta GmbH & Co. KG ASTM A335 P22 Alloy Steel Boiler Pipe Japan (Yokohama) NIPPON STEEL & SUMIKIN STAINLESS STEEL PIPE CO., LTD.
ASTM A335 P22 Alloy Steel Boiler Pipe Germany (Hamburg) VALLOUREC DEUTSCHLAND GmbH ASTM A335 P22 Alloy Steel Boiler Pipe Japan (Yokohama) NIPPON STEEL & SUMIKIN STAINLESS STEEL PIPE CO., LTD.
ASTM A335 P22 Alloy Steel Boiler Pipe India (Mumbai) SANDVIK ASIA PRIVATE LIMITED ASTM A335 P22 Alloy Steel Boiler Pipe Italy (Milan) TENARIS DALMINE S.p.A.
ASTM A335 P22 Alloy Steel Boiler Pipe India (Chennai) TATA STEEL LIMITED ASTM A335 P22 Alloy Steel Boiler Pipe Italy (Milan) TENARIS DALMINE S.p.A.